Your library card and password are required in order to borrow materials. You may borrow a maximum of 60 items at the same time. The borrowing limit for e-media (e-books, e-audio etc.) is 20 items. 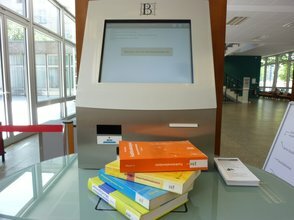 A fee is charged for overdue items based on the Usage and Fee Regulations for Public Libraries in the Federal State of Berlin (BÖBB). This fee is 0.25 Euros (0.10 Euros for children and school students) per calendar day and per item. You may extend your loans here. Want an email reminder two days before your loan is due? Then simply enter your email address under the “My Account  Manage email/SMS” menu item at www.voebb.de. It is not possible to send reminders by post or SMS! This service is a voluntary additional service. Not receiving the email does not entitle you to have the fee waived. The borrowing conditions of each individual VÖBB library may vary. Enquire in person if necessary! Loanable material from the Theme Room – No pre-bookings, requests or collection permitted! Bestsellers – No pre-bookings/requests or collection permitted! E-Reader - No pre-bookings/requests or collection permitted! Tablets - No pre-bookings/requests or collection permitted! Collections – Where do I find my requested items? Requested items are available from the self-collection area under your collection code. You can see this collection code online in your library account, and it is also shown on every notification letter. Requested media from the Children’s and Youth Library is available from the central collection area at the American Memorial Library (AGB). * To collect items at the Berliner Stadtbibliothek (Berlin City Library), head to the reading room on the basement level. Borrowing options – Where can I borrow items? Both facilities offer several check-out terminals for you to borrow items (in the foyer, in the service area, in the collections area, in the reading room, in the Children’s and Youth Library and in the Senatsbibliothek (Senate Library)). Items that cannot be borrowed automatically through the system, and which are labelled with stickers. Enter your password on the screen and click "log in"
Please place DVDs and CDs into the system individually, one after another. A window saying "Push item into slot" appears. Then push the DVDs or CDs into the relevant slot so that the item can be opened for use. A green tick alongside all items means they have been successfully checked out. To finish, press the "Done/Receipt" button. If you have any problems checking out your items, contact one of our staff; they will be happy to help. Borrowing information – What do I need to remember? When borrowing, please check the condition of the items, and make sure they are not missing any components. Report any visible defects immediately to staff so that we can make a note of this. If no defects have been noted at the time of return, we will have to assume that you, as the most recent borrower, caused the damage. In accordance with the Usage and Fee Regulations for Public Libraries in the Federal State of Berlin (BÖBB), we will then be entitled to ask you to pay compensation for damages. •Return requests: If you have not returned or extended your items on time, you will be sent a written return request 14 days after your loan period has elapsed. This request incurs a charge. •Payment requests: If your library account balance shows costs of 10.00 Euros or more, you will be sent a written payment request 14 days after these costs have been incurred. This request incurs a charge. We charge 1.00 Euro per letter. We reserve the right to take further legal action if you do not return the items or pay off your balance.